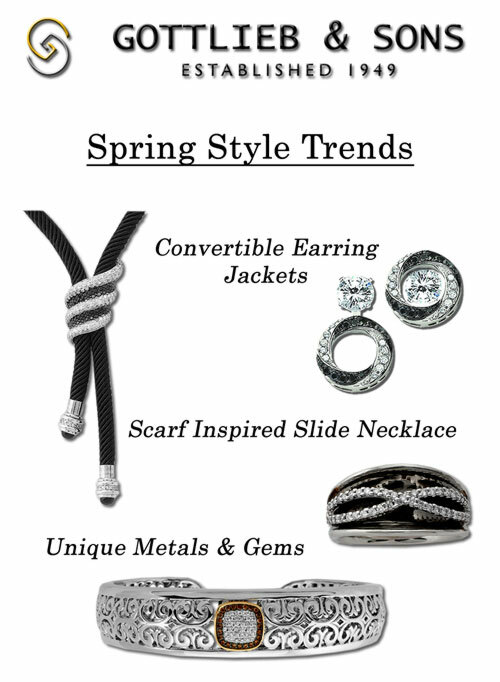 This past March, the Jewelry Information Center, posted their observations of the hottest trends for fine jewelry this spring. For Earrings, the Button is back. Very popular throughout the 50’s and 80’s, this classic look comes back with a modern twist. Pave diamond clusters and other smaller designs appeal to women of all ages. To get the absolute most versatility from a new pair of earrings, consider the Gottlieb & Sons Convertible Earring Jackets. With over 50 designs, you can get the “button” look with your own stud earrings. When the time is right, convert them into a dangle earring, and give yourself three distinct looks from one pair of studs. The Necklaces gaining popularity this spring are inspired by big bold scarves. This look usually has tassels of some sort, similar to the Gottlieb & Sons’ style 28637B. This thick black cord necklace holds a black and white diamond conical swirl slide and is finished off with diamond and Black Agate ends. The popularity of the Large Cuff Bracelet is waning, partly due to high gold prices and changing styles. Open Gold designs will be popular. Now more than ever, woman are appreciating the uniqueness of alternative gems and metals like Blackened Sterling Silver and Green Amethyst. Jewelry needs to be unique, versatile and durable to get into the jewelry boxes of women today and Gottlieb & Sons jewelry is just that.